The objective of the inspection was to assess the safety and the structural integrity of the trestles and its main components such as piers, trusses, hangers, bracing, connection plates and utilities. Shumaker Consulting Engineering & Land Surveying, P.C. (SCE) was responsible for performing the inspection, preparing a summary report, and providing recommendations for remedial actions. The inspection also identified the locations of the deteriorated areas, assessed the severity of the section losses, and provided recommendations for repairs. Under this multi-year term agreement Shumaker Consulting Engineering & Land Surveying, P.C. 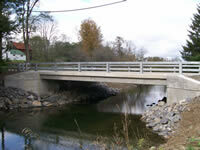 (SCE) has provided inspection services for more than 150 state and local bridges during 2008. 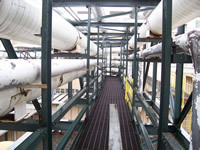 Structure types included thru-girders, composite, trusses and suspension bridges. 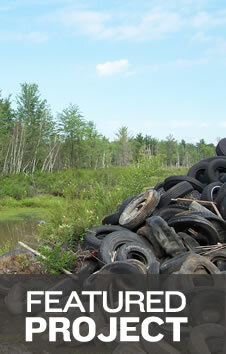 Responsibilities included hands-on inspections and reports for each structure. This local municipal project provided design and construction phase services for the replacement of two (2) bridges: CR 11D over Otego Creek, BIN 3353900, located in the Town of Hartwick and CR 11 over West Branch Otego Creek, BIN 3353890, in the Town of Laurens. 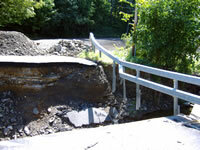 The project was prompted by structural, foundation, and roadway damage incurred during flooding in June 2006. Both bridges suffered significant damage on the eastern approach roadway, creating scour behind the east abutment, and the east abutments sank possibly due to a loss of supporting materials under the footings. Shumaker Consulting Engineering & Land Surveying, P.C. (SCE) provided construction support services, including review and approval of shop drawings and construction material specifications; interpretation and clarification of contract plans and specifications; and response to unanticipated or changed field conditions. Prior to reconstruction, the existing structures were closed to traffic.